This document is intended for Brandkit account Admins. Brandkit provides a way for Users to propose (request) that New Asset(s) be produced and added to the library. We call this an Asset Proposal Workflow or Asset Proposals. This is a new advanced and optional paid feature released late February 2018. This is a great way enable your users, use the power of the crowd, to either propose/suggest assets, that might be missing, request a localisation of an exisiting asset, to suit say a foreign market with different language requirements, or propose a new asset that is similar to and exisiting asset. Create a Social Network banner from an Image. All three of these situations is handled by the Asset Proposal Workflow. A user makes a New Asset Proposal by clicking the Propose New Asset(s) or Propose a Variation button or link (this maybe customised for each account with custom templates ). The Propose New Asset button/link is available in the User dropdown menu, or depending on your customisations from a custom page or widget. 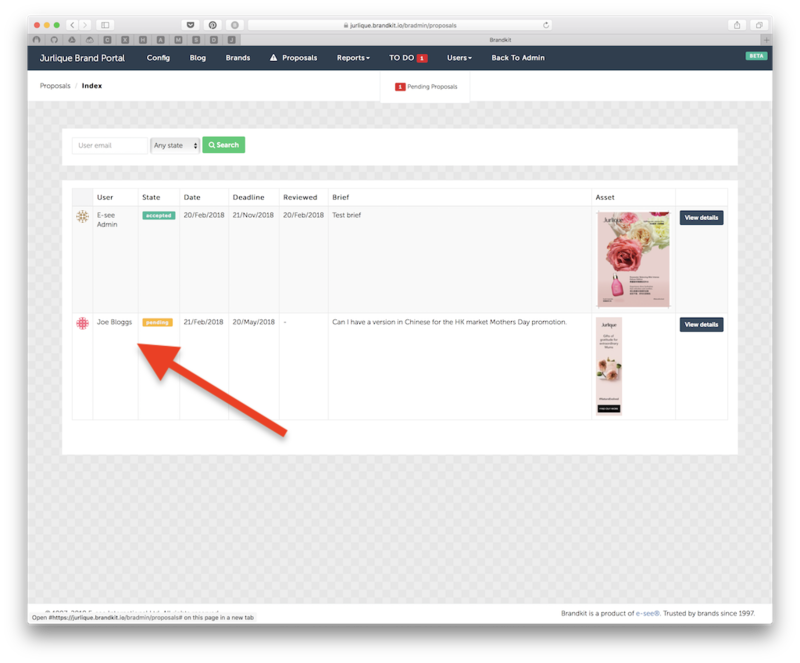 The Propose a Variation button is ONLY available on an Asset Detail page. In both cases Asset Proposal must be turned on for your account. The user is presented with a modal form to complete. Note: when the Proposal(request) is triggered from an Asset Detail page, it is deemed to be a request for a Variation of the current Asset AND the Asset is associated with the Proposal from that moment on (and is shown in the Form and the resulting Proposals listing). Up to to 2 x custom questions with specified input types and pick lists (e.g. Proposal Type and Language shown in the Example below) which are deemed required for the form to be valid. The Brief, Deadline and Attachment fields are default. Brief is required, Deadline and Attachment fields are optional. If configured in the account there is also a downloadable Attachment Template file. For example: This could be an excel document or a document format that sets out what detailed information is needed for the Proposal. Example: Request New Asset modal form for Jurlique. An Email is sent to the requesting User, acknowledging the request. Admins (and other Roles with the Manage Proposals ability) are notified by email and a To Do task is added to their menu in the Brandkit Admin interface. Admins click a link in the notification email or navigate to Users > Proposals to view the current Proposals. 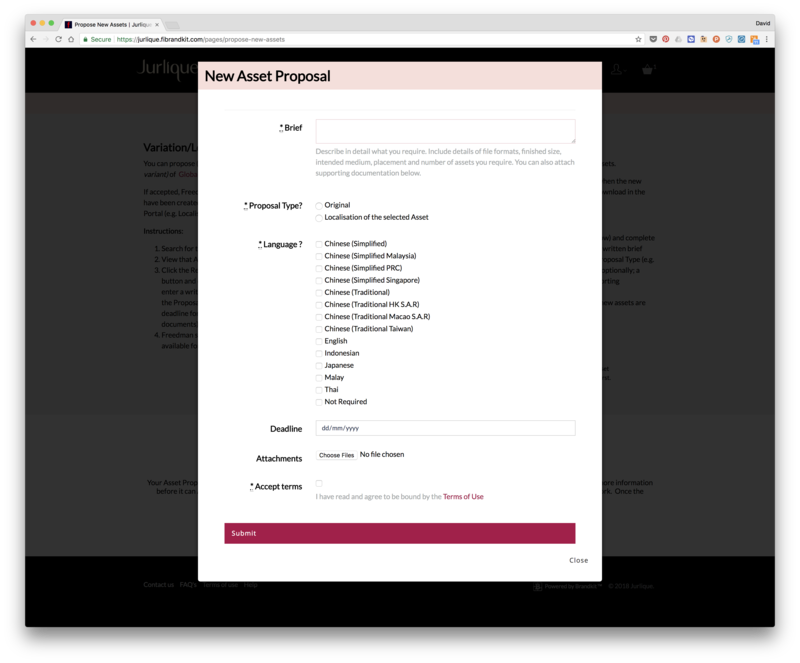 Example: New Asset Proposals listing in Brandkit Admin interface. Once an Admin Accepts or Declines the Proposal (Phase 1 of this feature), the displayed state of the Proposal is changed to one of either, Accepted or Declined. The Proposal is now considered answered or processed and the To Do (or Task) is cleared. The Proposal and all past Proposals are now accessible from the Users menu (Users > Proposals). An email is then sent to the requesting user with the response, Accepted or Declined (example email can be seen below). 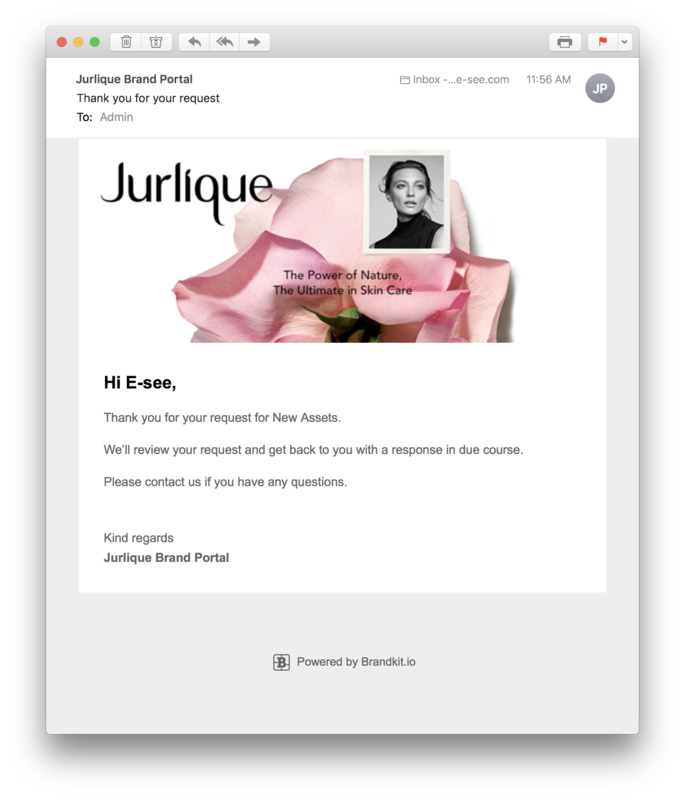 Example: Proposal acceptance email for Jurlique. Account Admins are then responsible for ensuring the new assets are created and uploaded to the account in the normal way. This workflow should be handled by your company or agency, as you would normally - Brandkit doesn't get involved in your internal workflows. 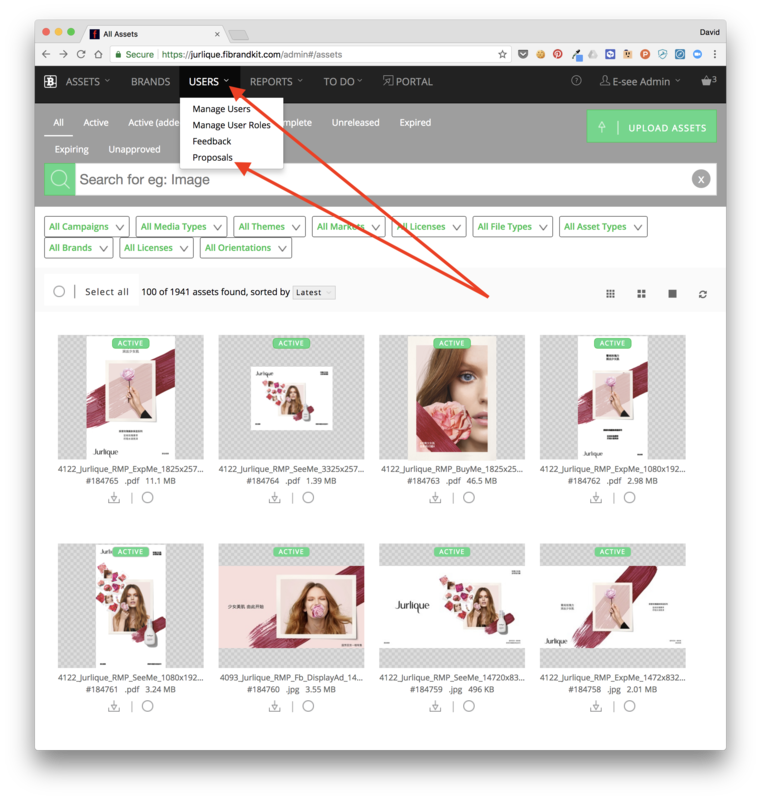 Once any new assets that derive from the proposal are ready, an Admin should upload these new assets to the Account, and share those assets with the original requesting user using the Brandkit Share process (or any method that suits you). An Admin should then navigate back to the original proposal and mark it as Complete. The To Do task will now be removed and the Proposal marked as Completed in the Proposals list. When accepting a Proposal, Admins will be able to edit the brief and allocate the work to a particular User Role/User, for action. Admins will add new asset ID's to the Proposal (when Completing a proposal) which will setup an automatic relationship between the original assets (if a Variation is requested) and the derivative variants. Requesting users will be sent an email automatically, announcing the completion of their proposal, with links to the new assets. It will be possible to propose Variations of Assets and Similar Assets based on a batch of (multiple) selected Assets. When Proposals are accepted, the work will be able to be allocated to external creative suppliers and workflows via an API. Proposal workflow on or off. 2 x custom questions with specified input options (i.e. Radio Buttons, Dropdown Select, Check Boxes, Multiline Text Box or String (small text box). Customised button text, Nav links, via custom template. Turn on the Proposal Workflow for the Account. Configure up to 2 custom questions and form sub-title. Default questions, include Brief, Deadline and Attachment (and are non editable). For each User Role you wish to be able to make Asset Proposals, turn on the Submit Proposals ability. Note: this is on by default for Standard Users and Admins. For each User Role you wish to be able to Review and Manage Proposals, turn on the Manage Proposals in Admin abilities. Customise the Propose button if necessary with a custom s3 Template. Add a custom Asset Proposal Workflow Widget or Page for users to describe how Proposals are used/created.